Wallach’s sight began to fade while he played guard for the White Plains High School football team in the 1940s. By senior year, he had given up playing and was team manager, a position he called underrated: “It was the best job to have,” he said. “Better than playing.” The gold football on his keychain is a memento of the 1945 squad. Wallach’s son, Todd Wallach, is now president of the agency. “I’m not CEO,” Todd gently corrected his father. “General Motors has a CEO.” Rachel Faber, the agency’s commercial lines manager, completes the office lineup along with Barkin and Sicuranzo. 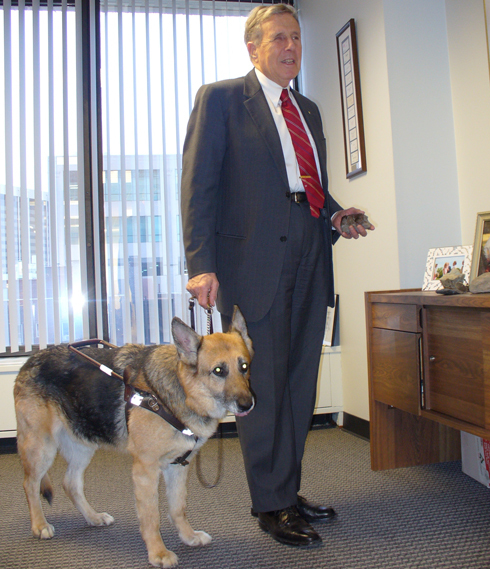 At his feet is 12-year-old Fritz, Walach’s sixth assist dog: “He’s very, very good,” Wallach said of his companion-in-harness. In addition to Todd, Brian and wife Beth have a daughter, Jennifer Thomas, and five grandchildren. Not the retiring type, Wallach has always maintained a rigorous physical life. He bikes on a tandem bike. Last year, he and his tandem partner, David Eddy, raised $12,500 for multiple sclerosis research. The bike is a ’77 Schwinn that Wallach identifies as “mint; a guy comes to the house to service it.” Wallach and Eddy also have ridden the five boroughs of New York City 20 times during the city’s annual 43-mile cycle event. “The hardest part is when you get off the bike,” Wallach obliged with a laugh. Further setting the example for septuagenarians everywhere, Wallach is an active swimmer, even doing laps one day per week in the winter. The active life can produce its own artifacts and a tabletop in Wallach’s office bears a geological record in rocks and crystals of his journeys. He identified flint and schist and quartz crystals by feel. “New York City is built on schist,” he said. The flint is from England. A conversation with Wallach – upbeat and engaging in every way – is an object lesson in the life well lived. He was just appointed to the county Legislature’s Compensation Advisory Board and is founder and past president of the White Plains Beautification Foundation. He founded and was president of The Westchester Lighthouse. He has been or is involved with 15 civic groups and has received 18 civic awards from groups as disparate as the White Plains YMCA, the Jaycees, the Rotarians and White Plains High School.